It’s spring cleaning day at Casa de Flury! So what if it’s a dreary 36 degrees outside? Who cares if there is technically 6 more weeks until spring? It’s amazing how some fresh-cut flowers and cranking up the thermostat can fool the mind into thinking we’re in the midst of an early spring heat wave. In preparation for the (hopefully soon) return of my lovely spring-time frocks (which are currently hibernating in my attic), I am cleaning out my closet today. Goodbye sweater-I-haven’t-worn-in-three-years. Sayonara fuchsia-flats-I-once-thought-were-cute. And you, skinny-jeans-from-freshman-year-of-college…this has been a long time coming, but I’m afraid we must finally go our separate ways. I have outgrown you (in more ways than one) and it’s time for you to move on to someone more age appropriate for your low-riser ways. I’m packing up my former favorites and off to the Goodwill they go! While I may no longer have a need for olive, patent leather flats, I’m certain someone else will. Need further proof that one girl’s trash is another girl’s treasure? 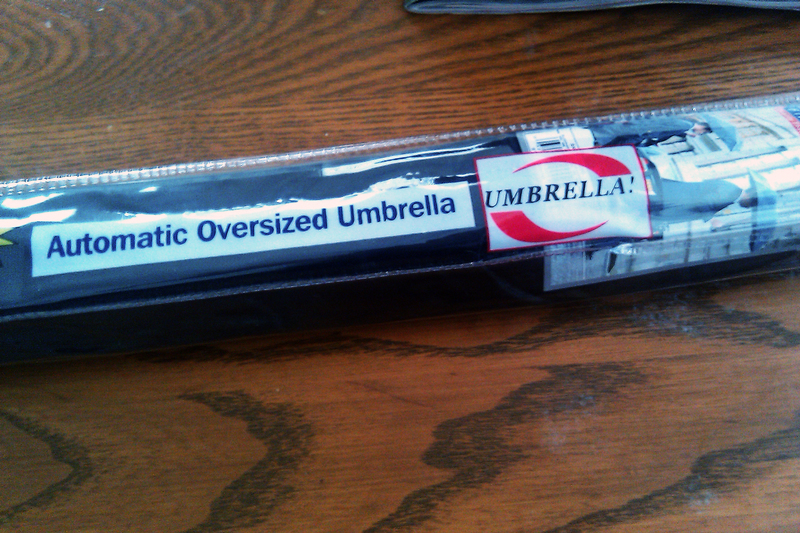 As the donation drop was being made, I spied a fabulous black umbrella ( brand-spanking new, I might add!) on the Goodwill shelf — a complete steal at $4.99. Can’t wait until our next dreary day to put it to good use!